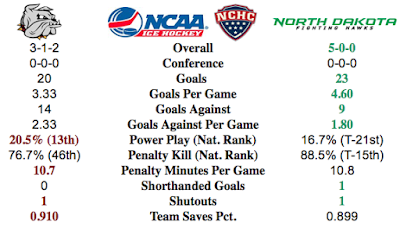 It is early in the college hockey season. This is the earliest start for UMD hockey and the first 2-0-0 start since 2001-02 (Maverick Stampede Tournament) and the first sweep of one opponent to start the season since 1995-96 (Ferris State). There have only been five total NCAA games played, but already UMD is making a statement with their sweep over Michigan Tech. Now the stakes are higher with a fellow top ten ranked opponent in UML and playing them on the road. 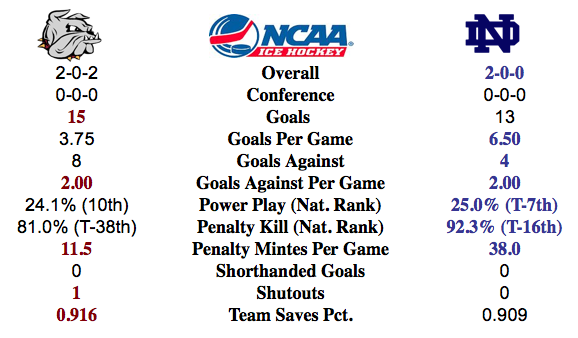 Like UMD, UML ended their season last year in the NCAA Regional Finals and roster nine freshman this season. It will be a matchup that will give a broader view of the prospects of both teams even though we are not in double digits of October. Bulldogs have a perfect 10 for 10 on penalty kill with one shorthanded goal. UMD is currently clicking at 33% for power play. Picks by @afiskness. One week is in the books for UMD who looked great against Michigan Tech in the 6-0 shutout Saturday night and the gutty come from behind win. This week the Bulldogs go out east to take on the highly ranked River Hawks of U-Mass Lowell. It will be two highly entertaining games with these two good teams. Ferris State vs. Western Michigan: This is a home and home home series and I just don't see the Bulldogs starting the season 0-4. I will pick the home teams winning resulting in a split. Miami @ Providence: This is a good test for the Redhawks going out eat to play a ranked foe. The Redhawks should be a good team this season, I will pick a split. 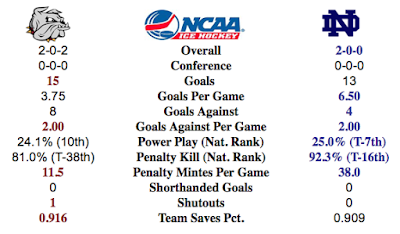 Colorado College @ UMass: The Minutemen had eight wins last year to trump the Tigers six wins. Two evenly match teams playing two games often end in a split. Minnesota Duluth @ Massachusetts Lowell: The Bulldogs are red hot after one week of play. This should be two great games that will result in a split. 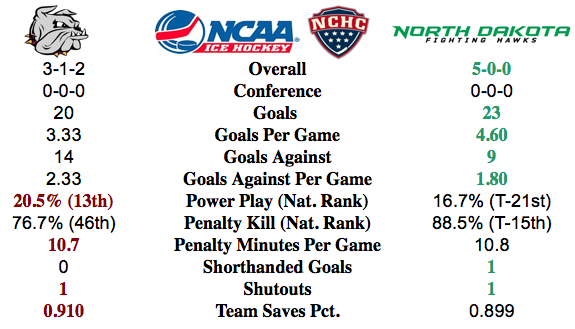 Canisius @ North Dakota: The reigning nation champion Fighting Hawks will have little trouble earning a sweep on home ice this weekend. Ohio State vs. Denver: The Pioneers will advance to the championship game. Denver vs. Air Force or Boston College: I am going to say BC will advance to play Denver and Denver will get the big win for the tournament title.